On August 22nd, 5th International Multimedial Art Festival - IMAF 2003 was opened at MAS Gallery in Odzaci. During the Festival, in organisation of Multimedial Art Studio, was opened international exhibition “Nature of performance – performance in nature” by Nenad Bogdanovic. On this exhibition, which connected phenomenon of Nature and art of performance, were exhibited works made by more than 70 authors from 30 countries. It contains a large amount of documentary materials such as objects, photos, sketches of projects, computer graphics, books, catalogues and posters. Besides the exhibition there was a presentation of documented performances by video, audio, CD rom and digital documentation. Nature of performance itself, where an author uses his body in artistic actions along with many objects from his natural habitat or the action itself is made in natural environment, justifies the selection of the theme. Exhibition displays wide spectre of interests and actions made by artists worldwide on this theme. To show this, I will mention just a few of these authors and their works characteristic for the exhibition. Slavomir Brzoska from Poland on his journey through Russia and his artwork “Journey to Tuva” paints selected piece of rock red, noting his presence in time and space. Phenomenon of alienation of moder man was presented by Fernando Aguiar from Portugal with sound poetry and usage of the cage in which, instead of birds, are certain words on white paper. Process of performance documented with photos before and after shaving and an object (facial hair) were exhibited by Joan Casselas from Spain. Adina Bar-On from Israel exhibits photo documentation of her performance made from great distance showing her body in the forest barely notable as the tiny white spot. Young artist from Switzerland Judith Rothlisberger brings domestic animals into the Gallery (dog, chicken) thus experimenting with dialectic terms and situations of interaction appearances. In her video work “Movember” Italian artist Caterina Davinio proves possibility of complementary relations btween nature and urban life with additional realisation of exhibited objects through computer graphics. Kirsten Justesen from Danmark in her perfo-instalations confronts fragile, worm and naked female body to gigantic ice cubes. Victorine Muller from Switzerland undertakes extreme risk when performing experiments with air pumps and staying in plastic tubes filled with water. German Boris Nieslony realises very strong performances and installations using unique sample from nature like rock or other natural material. Art works identical to orthodox visual poetry showing interactions of opposite elements were exhibited by Renata and Giovanni Strada from Italy. 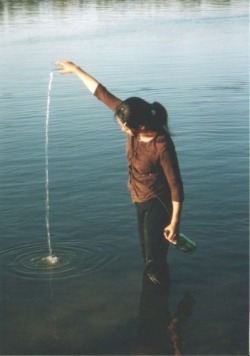 Lezli Rubin-Kunda from Israel offers us “Series of daily interactions”, of her body and earth, water, tree, plants, etc. After the opening of the exhibition Nenad Bogdanovic made a performance “Man gallery – place of fear III”. On a 10th year of his artistic project “Man gallery” in which Nenad Bogdanovic uses his body as exhibition space, this time he exhibits a large political map of the world. Cutting certain parts of continents and states, measuring the world with metal plate with inscription “Ort Der Angst” (Place of fear), with terrifying sound background, pronouncing “Global village” to be global place of fear. For the next two days Festival has been moved to a nearby place known as Kamariste, 15 kilometres from Odzaci, place rich with forest at the banks of Danube on a border between Serbia and Croatia. 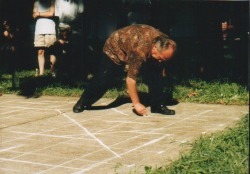 Era Milivojevic, artist from Belgrade, found a concrete square in this beautiful natural environment that served him for his performance “Milky way”. Space was improvised into a large chess board, and this ancient game was changed through performance into an art work. Playing chess with the audience, or in this case with himself, victor is always known – Art. From Spain comes a “Walking tree” Angel Pastor with his art project. Angel prepared this project in Spain printing special T-shirts for this festival with a picture of a tree characteristic for this part of the world. He dug a hole and planted himself during the performance. Then he sold the T-shirts to the audience for the price of the smallest coin they had in their pockets at the moment. Collected money he placed into a hole where he was planted. Author made this work honouring his father and his fatherland Catalonia. 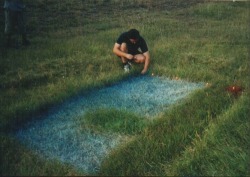 In his performance “Illiterate painter II” Radoslav B. Chugaly from Odzaci paints the picture, by cutting the grass with small scissors, in the shape of classic landscape. This landscape within landscape was “painted” whole afternoon. In the dusk of the same day, Radoslav lit the candles surrounding finished painting, which reminded an aura, one could say for the classic painting. Three hour long performance, made by artist from Scotland Kenneth Mc Bride, “Asylum Europa: recoil from reason II Cosmic disobedience” points out to difficulty of former and actuality of current hard situation on European continent. Kenneth is placed on the bank of Danube for a long period with his head in the water covered with a map of Europe. In his hand is a white stick used by blind people pointed to the other bank, bank of other country, as if he wishes to cross this big river and the river of problems between two states that can not be solved easily. In the second part of his performance he walks of in the woods and places map of Europe into a grave. Around this improvised grave he gathers audience offering them bread and wine as on funeral. Also long lasting performance “Natura morte” was made by Roddy Hunter from Great Britain. 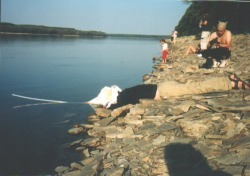 The event takes place on the bank of Danube, near a large tree taken from it’s roots by storm and placed in the water. 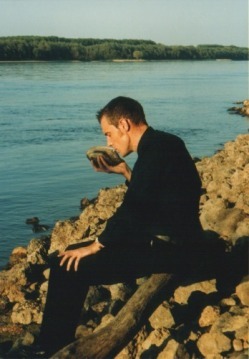 Hunter sits still on the bank, dressed in black, holding a large shell in his hands near his mouth. In the border area, borders of endurance, borders of life and death. All these are challenges and questions artists gets answered during his performance leading us to think different and find our own answers. Playing with relations between male and female Sinead O’Donnell from Northern Ireland in her performance "Fe/male: global paranoia" gathers attention with her appearance and behavior. In her earlier performances she worked with mask on her face. Now she is without the mask, trying to unmask the others in their paranoid stands. Sinead started this work in Belfast when she started her journey to Serbia, via London and Munich, continued on the bank of Danube, and finishing by returning to Northern Ireland. Aleksandar Jovanovic from Odzaci continues his explorations regarding relations of art and religion in his performance “20 apples”. Author marked his body on the ground and dug up one layer of earth. 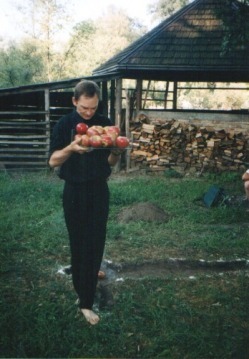 Reading apocryphal religious text about sins, Aleksandar walks around this figure and places an apple for each sin on a certain place in the figure. Perfumed smoke from the center of the figure completes strange atmosphere this perfected performance. Yu Kuramoto from Japan with “My participation” diverts attention to global problems of arrogant consumers society. She comes jumping from the forest to her goal (bank of the river). Flowers she bought in the shop is being planted in the sand near the river and watered with mineral water. Then she plants wild plants with natural ground, drinks and waters the plants with water from Danube. Her work is a critic and remark that we should not forget primeval sources of life and survival in this consumers stampede. “I feel now more than I felt when I came here” is the statement and title of the performance realised by Justin McKeown from Great Britain. 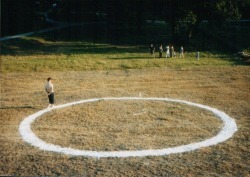 On the meadow on the bank author drew a large circle with flour, more than 20 metres in diameter. Justin walks on flour – circle line in the late of the day and the beginning of the night. Simplicity of the given elements and way of performing gives him strong visual and artistic effect. Last performance made on this year’s festival is titled “Home”. This is a joint work made by Sinead O’Donnell from Northern Ireland and Yu Kuramoto from Japan. Artists in this performance take a piece of landscape as space of intervention. They use certain marks to label all mole hills in the selected area. Performance is completed by ritual exit, heads covered with a board, to the bank of Danube letting the piece of wood to flow down the river. Interesting work by two authors from different continents with agreement on realisation of joint project in short time period. It is important to mention that in the financially difficult terms IMAF continued to present actual artistic manifestations and artists from domestic and international scene. Resume of IMAF would be: Valued exhibition experiment with important participants from all over the world and eleven quality live performances marks the festival as important place on international chart of contemporary art performance. 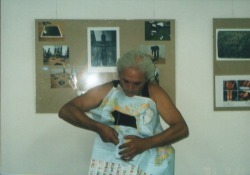 Opening of exhibition "Nature of performance - Performance in nature" (from August 22nd to September 30th , 2003 in MAS Gallery, Odzaci). / Otvaranje izložbe "Priroda performansa - performans u prirodi" (od 22. avgusta do 30. septembra 2003. u galeriji MAS, Odžaci). It is lovely meeting point. Unity. Love. People. Poetic. Nostalgic. For me it is very enjoyable to have a work in Nature ambience. More than that, the people I met at IMAF is valuable. IMAF is extremely important for a number of reasons. Firstly, it represents The Long - Term Dedication of Multimedial Art Studio toward international dialogue and cultural communication. This is especially important given its location in Serbia socially, politically and geographically. I could also mention that the festival is widely recognised abroad and that many artists would wish to have the opportunity to attend and participate in person. I hope very much that the Multimedial Art Studio are supported financially in the future to ensure this possibility and continue their important work. IMAF is a good festival. IMAF is a good oportunity to see and experience life art. Like a performer I have felt free to do my work and I have got good feelings from audience. I thing that people who organise IMAF are making big efforts and good work. IMAF is an important international meeting point for art. In it's 5th year, IMAF festival appears to be growing in confidence. Last year when I was here there existed a certain tension. It was obviously a very good stimulating time - which is why I returned this year. The 5th IMAF, however, had more of a sense of strength about it - a strength in self belief. Perhaps the site of the festival with the context of borders, the flowing river - as a metaphor of life - had much to do with it. IMAF organisation is growing in confidence and in many ways it represents the "social body" of the country. Transition carries it's own trauma - wounds don't disappear overnight - but the responsibility of the individual - what the artist - individual tries to do is to take a very close look at the wound, to face it, face the wound, and introduce yourself to it - it is yours. Lay claim to it. It is a space of identity. The 5th IMAF appeared to be open to this investigation. It returned to the nature (forest, river) in order to offer this opportunity. It was a very courageous & inspired decision and should be supported next year. All of the sponsors have been terrific in their support. Perhaps the 6th IMAF could be organised for a longer period such as 5 days and people from the region could incorporate it in their camping holidays. Be strong. Love life. 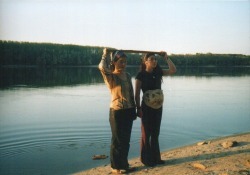 Performance in Nature, IMAF 2003. is an important step for ward in artistic growth. Connecting artists around the globe to exchange ideas, ways of working and a network of support. It is an opportunity for us to respond to not only artistic actions and nature but(ili bit) form strong bonds of understanding & friendship. always a good opportunity to see how the curatorial background works. works, also the audience can watch all of them as they are after each other. I have only some subjective comments which can be useful in the future. Europe to come and take part in the Festival. Different perfo-poetics, high level od dedication to one's own creativity and enormous desire to give creative maximum and set up spiritual communication with the audience. In wonderfull natural ambience of Kamariste near Danube which was additional stimulant to step out "one step extra", authors made this 5th IMAF reach it's highest creative level. 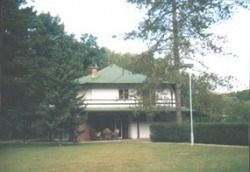 The 2003 IMAF festival took place at a magnificent location. The location, a circular structured hunting lodge in a clearance in the woods was a space in total accord with this year's festical title: The Nature of Performance, Performance in Nature. It also had the capability to inspire further work - apart from the ones the artists „officially" presented. In brief, the setting offered the best possible conditions for artists to work with and in. I think a new kind of performance among net-art, real action, video-action is a good starting point for reflection on the topic "nature of performance, performance in nature". Objective of performance art is to communicate with the body, with the voice, to create an interaction area which contaminates the real space of life with art, and art with real life. But the concepts of body, identity, action, interaction have radically changed in contact with the Internet, and, with net-art, appeared the idea of dislocation of body and of action in cyberspace, of multiple identities, of collective cre-action. the nature of performance have been transformed using communication technologies. I worked since 1998 in this field, realizing collective works in the Internet, and video-performances, not as performance simply recorded in video or documented on line, but realized with / through the video language, the Internet, and the use of e-mail communication flux. I am experimenting a new kind of dislocated collaborative performance in a continuous passage from virtual to real; some works are: Paint from Nature (2001), Global Poetry (2002), Fluxus Walk (2002); they were events which moved through the Internet, were performed in collaboration with other artists living far in the world, as e-mail interchange, data transfer, but they also happened in real places, and became contemporaneously digital videos, installations, web sites, real performances. In Hands on Environs, I gasped and grasped for breath, meeting the elements, acknowledging their power, their ability to reclaim and destroy and honouring their presence. It was not a precious enactment. I was not to be a victim. I was, in both the rehearsing and the performing, cold, wet, blown to the edge of the water and deafened by the roar of the waves, wind and rain pounding and sweeping around me. It was a heady experience, certainly not tame. My strategy was to make my hands, as the agency of my making, active to ritualize both the ending of breath and the beginning of another. In this case the end of breath was my mother's, the taking of new breath, mine. Watching my mother's death was very much the witnessing of breath ending. Dying of lung cancer, she literally choked to death. At the end, while finally at peace, she let go of controlling and manipulating the people and environment around her, accepting at the last. Breath simply was there and then was not. But it was, for her, a fearful transition. Do we really know our breathing? Are we really aware how we choose to live, to take that breath? That is what I wanted to discover. I wanted to bury my mother, acknowledge the ending of her breath and to gasp as an infant at birth for my own. I wanted to reclaim my choice to live - to rage, to reach, to throw, to be alive and active, battling the wind, waves and cold. And I did just that for Breathworks. And as I acted it out in front of other witnesses, an audience, on the evening of the 25th of May, I threw all the garbage, those past patterns of my mother's, away on the wind, over the waves, into the water. And I took my own breath. We come into life actively. Let us live it that way. It is too short. Dance, write, throw, sweep and breathe! and refined, that he possesses: the muscle body, the nerve body. functionality, has no tasks to bring to term, stops making itself useful. Hands grasp emptiness, close over objects full of poetic intimacy. the word dies feebly, certain of its silence. investigates the chastity and enchantment of the trembling body. Working thus, he divides the word from itself, he cuts its mouth. Each word hides an abyss, lives its song in the burnings of the poet body. him in the utopia of communion. reading hole with a humid entrance. lightless altar and a faceless theater of stone. I don't know the nature of performance; I know, why I create performance in nature. My trips to selected places on Earth indeed loitering about in space, without plan and are a kind of meditation and harmony. Then my breath becomes rhytmical. I need purpose. When my hands travelling with kilometers of strings around stones I find, these trips booth of these experiences. To smell, see and hear the real world. I wrap up stones in nature to leave sign and I am going further. "Unitled "(Wishes, Lies and Dreams ) is a series of experimental Performance and VDO art depicting the world of "Unconscious"
"Unitled "(Wishes, Lies and Dreams ) is created to explore intimacy and emotional resonance with the viewer with combines artistic and fantasy to expores experience of remembering ; questioning the fantastic advanture of nature, recognizing disquieting patterns, facing emerging memories, understanding the nature. Segments are combined with bluring images and vauge to create and impression of subconscious memory and dreams. "Performance in nature-Nature of performance"- I feel as an artist that the nature of performance is of the unique nature within ourselves 'human nature', the urge to create, the willingness to try new media in new territory using the body as medium and as some sort of physical metaphor that enables an audience to have a live experience just like the artist. "Perfomance in nature"- Literally for me, the everchanging environment is an inevidable process that is re-occuring over and over like the artist does time and time again with new work and new mediums. I feel that live art is crucially dependable on the site in which enables the artist to manipulate and translate a visual language that speaks for the place that it is created in and also to the audience and the artist that performs it. PERFORMANCE IN NATURE evolved for me in recent years. Live and art very often closing on one another. Medium of video camera is making this possible more then ever. The rest is to find yourself on inspiring location and let camera register result of meeting between PERFORMANCE AND NATURE. Later the whole thing is translated into language of videowork. I consider nature itself to be a performance were I as a viewer am sometimes not to clear of the fact that I'm a part of it. Regenaration is a video that in a way mimics the slownes of changes in nature; but it keeps on regenerating flesh wich of course has nothing to do with the reality of nature but more with the human state of being; I'm not totaly aware of the fact that I'm mortal, although I know it. In my view performance art dealing with nature could be an eye opener to the real fabric of nature; just by changing the rules a little so that it will become a different view of the unchangable conditions of human being. The work "the end" deals with the regenerationprocess. In this videoperformance which is looped the performer try to mark the screen endlessly while the nature is covering the trace of the performer. This work comes out to be a sisyphus - work. I want to be natural. My wish to be with nature is my first disturbing nature. I hesitated. I am afraid. I want to escape. My wish to be away from nature is my second disturbing nature. I just want to be, but I can't be. I just want to do, but I can't do. I just wish. I wish I were natural. In several cities across Europe, a beggar like figure demands the passer-by, in many different languages, to DISCOVER HEAVEN. On a seashore headscarfed figures meet from dawn till dusk. Hanging in sail of wing welcoming the other approaching the coast on a surfboard, praying together, messages are put in between the joints of the huges wall, corks are thrown into the water, bottles against the embankment, wounded, setting fire to belongings, praying, endgame, high tide. the public, in unexpected site and spaces. I create work which will have no definite answer, just as philosopical investigations have no definite answers, the answer can only be arrived at by the viewer and the baggage that they would inherently bring to the work. I see my work as open-ended, I do not propose to give answers but only to ask fundamental questions. Searching for the heart of the city. Traversing its power station lungs and arterial roadways. Beneath the busy streets the primordial waters course unheeded. The cardboard beds and tunnels of love lie sodden with piss and unspent dreams. The shallow glint of glass and steel. The unchallenged authority of the concrete. Stand facing a wall, your face unseen. Stand still. Stop. For a moment. The city stops for a moment. The city as body stops... for a moment. The city's gaze is fixed on the one point, the nape of the neck. The sun is shining on that point. A single golden hair glows in the city's dark light. A trembling threat. The city teeters on the brink. An empty coffee cup rattles. At sunset, from a balcony, the seated audience observes the small white moving figure in the distant landscape. Though far away, the state of mind of the far figure can be deciphered in its movement and trails. Through personal headphones the audience listen to a monologue whose meaning can be understood as description of the view of nature or of my state of mind. The viewer immersed in the reading of the signs of the smal figure becomes familiar with the new environment and thus confronts his own emotions and fantasy. This performance blurs the line between the intimate and distant, the private and the common. In a way it is a declaration of the legitimacy of the romantic, in our seemingly sophisticated culture; A promotion of empathy -. Nature of Performance, Performance in Nature: The uniqueness, the spontaneity, and unity of place, time and event in conjunction with the artist's will to express. My partner Miriam Jordan and I performed "Cha-no-yu and Me" as part of a performance festival in Wortley Village (London, Ontario, Canada). For this performance we wore hand printed robes and stood in front of the library serving people hand-blended iced tea, at random as they walked by, off of a wooden tray strapped to our bodies. After the performance was over we were siting in a nearby café when a women. who had turned down our offer of tea during the performance, came over to discuss her reaction to the work. She explained that her reluctance toward the work was due to the fact that it was so foreign to her. The ritualism of "Cha-no-yu and Me" was obviously not christian based, and therefore she felt it was wrong in come way. But she was so moved by the gesture of our offer that she questioned her initial reluctance, crying as she was telling us. 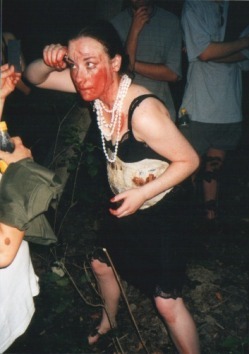 It was at this moment that I came to realize what the nature of performance art was for me, an acting of giving. In nature, everything moves and develops. Nature is either faster or slower than human beings. A tree is slower, a dragonfly or the wind is faster. Natural materials enable me to connect with the wind. They enable me to take on the various speeds and to touch the laws of nature. A dialogue, an exchange takes place. Nature moves me to perform. I wish to play music un nature. I like to listen music in nature. I love to hear sound of nature. The connection between the Performance Art and nature, it could be traced back until the beginning of mankind. At that time, human beings let themselves be guided by their instincts, through and uninterrupted dialogue with nature. This dialog was carried out by mean of expression of ritual-forms. But, during the long rationalization process of our occidental culture, we lost such natural pristine contact. The Performance Art that appeared at the beginning of last century, arises as a response to that rationalism and impelled by the need of searching spiritual development. Hence, the art of performance plays a role as reunificator between of human beings and the natural media. It takes us through rites wich allow us of being close and alert to listening again our own internal voices and the legacy of the collective unconscious. Nowadays, performance comprises an extended range of practices, actions or interventions. They give shape to diverse manifestations, very different from each other, and even opposing. But this plurality is not a sign of dissolution or lost: rather it makes way for a practice which multiplies itself, creates intersections, interchanges information, superimposes or overflows onto itself. From the territories of painting, music, sculpture, theatre, dance, film, writing, installation, environment, poetry, video or computer, the performer builds and articulates ways of creating that are anchored within two, or more, specific areas. The performer never pastes them together, but fuses them. Never approaches them, but intermingles them in a way in which they lose or almost abandon those features which made them belong to a specific area of the artistic practice. The performer's body intervenes as another element, material or implement along with those which he is surrounded by and which he relates to. A culturally marked body that will not use the objects he has surrounded himself by, those which inhabit the space of the action, but rather will articulate with them. Performance is not logical. It breaks up the discourse. It subverts the habitual syntax of the events. Performance places us in front of a discontinuity and it doesn't provide any particular solution. In some occasions, it leave us at a crossroad of possibilities: once we are there, we don't know if the way we have decided to go will take us somewhere or not. But maybe, in any case, nowhere will mean somewhere. Nest ist one videoworks 5" whot I have shooting in America (Boston), and Skopje, Macedonia. My base idea was to conect two city. The dream of every Macedonian's man from ansestors it as to go abroad from own contry, (especialy in America) and found promise NEST. But whot is nest? Needs or... wish. How many nest we can bild through our own life?! Lot of them. The people is look like the bird, they can bild always a new nest where they are. But, the nest will be always with equipments and habits from the lend from where they commng. They can't give up from habits, they have aspiration for tradicional equipments. They have roots, but... I ask myself which nest will be better where are our's roots or good conditionale for the life. -I seek to engage with the world by stepping lightly, without expending, impinging or destroying; to find moments of abandon in simple ceremonialactions and with a frugality of means, temporarily recordering transient organic matter before it disintegrates or is swept away. -Interacting with common natural materials, on and through my body, I seek to form connections to place, to feel 'at home', both locally, and in the larger context of our fragile existence here on this planet; to reaffirm the primal facts (even within the imperfect, compromised sites of human habitation which most of us occupy) and to recover perhaps a few of the unraveling threads of our interconnection. -Through spontaneous purposeless play, I want to re-experience nature in a fresh, unencubered way, beyond the cultural constructs of time and place. -Carrying out actions within a natural environment, content is determined by the materials themselves, and by the constant changes within a site, working with what is available, depending on the season, time of day, weather, and by the rich sensory triggers of the natural materials themselves. Nature, like performance, is impermanent, in constant flux. -There is a creative tension between the direct encounter with the natural elements, and the mediating presence of contemporary technological documentation. PROTEST BEING (2:00, 2003) documents the artist marching with his placard on a deserted mountain expressing his existential angst. The tone is ironic and self-depreciating, but still earnest. These are the things that trouble the artist, but by declaring them openly- as if they were a social right- he becomes and absurd figure. His liberal media critique is more the product of a spoiled individualism, than social inequality. The artist recognizes the privileged nature of his critique but is still trapped by his alienation.